Fig. 3. Application of the KASP and gel-based markers to genotyping of the segregating F2 population. Genotyping of 20 Komboka/IR49830 F2 plants were performed with Sub1A_SNP1 and Sub1A_SNP2 markers (A). 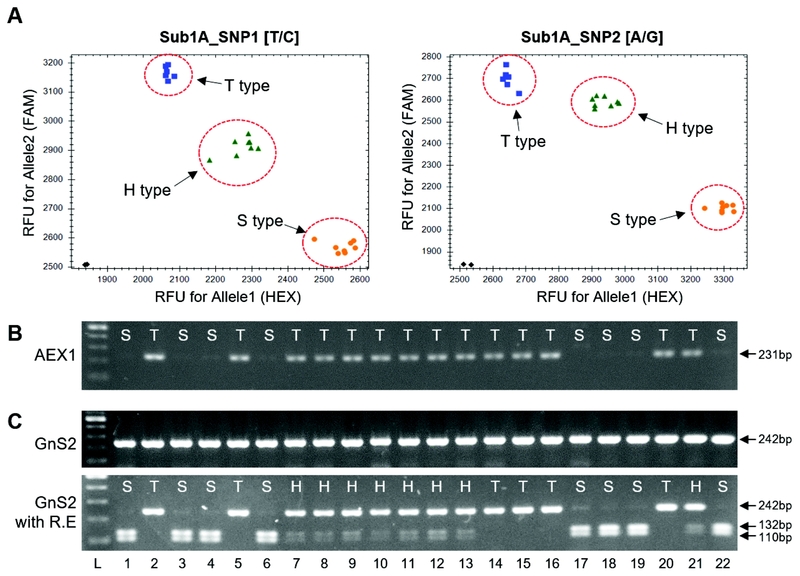 Two gel-based markers, AEX1 (B) and GnS2 (C), were used to genotype F2 plants. Gel images before (upper panel) and after (lower panel) treatment of restriction enzyme are shown in (C). T: tolerance, S: susceptible, H: heterozygous, R.E: restriction enzyme, L: DNA ladder.